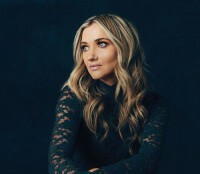 If you're a country music fan and particularly if you're a regular attendee of the Country To Country event, you'll be very familiar with the name Sarah Darling. Although she still lives in Nashville and has recorded three albums there, it's in Britain that Sarah has built a large following. In 2017 she was nominated for International Artist Of The Year by the British Country Music Awards and is currently undertaking a short UK tour with gigs in Glasgow, London, Manchester, Liverpool and Leeds. Sarah was born in Des Moines, Iowa on 4th October 1982. In her early twenties, she was a top three finalist in a reality show, The Entertainer, but was advised by middle of the road icon Wayne Newton to head for Nashville rather than Las Vegas to pursue her music career. By 2008 she'd recorded her debut album, 'Every Monday Morning', and three years later the CD 'Angels & Devils' where a countrification of a U2 song, "With Or Without You", gained her some interest. It was her third album though, 'Dream Country', which brought Sarah her first Hot Country Songs chart hit with "Home To Me" reaching number 34. For her new album, Sarah has taken a very adventurous step, in that she's recorded it in Britain with a bevy of top British producers and co-composers. The release of 'Wonderland' has now been put back to June. I spoke to this effervescent young lady about her album and her faith. Tony: You've been working with a lot of very technical people, haven't you? This album that you've been recording in London is done with a lot of people who I would call techno heads. Sarah: Yes, it's kind of interesting isn't it, that a country girl from Nashville decided to make a country album in the UK, with two sets of producers. Both sets had never worked on a country record before. In a way it was really fun for all of us to experiment together and not go too far electronic-wise. The first producer I worked with was a guy named Jim Elliot; he lives in Wales, Hay-on-Wye, and I stayed there for a couple of weeks. He works with Ellie Goulding and some amazing artists so it was really fun to get his pop influence on my country vibe. With the second group of producers we worked in London at RAK Studios, which was really exciting. It's one of my favourite studios to be in. I worked with Tim and Roy and they have worked with some of my favourite artists. London Grammar had a record I really loved so I've always dreamed about working with them. It was exciting to get their influence as well. Tony: Did you feel there was a bit of a risk in that you are known and acknowledged as a country singer that it could simply be not country enough for country followers and too country for pop fans? Sarah: I did think about that. Part of me is being a little bit of a risk taker. To me 'Dream Country' was a risk, when I did that in Nashville because it's definitely not the type of country that was coming out at that time. I think it's really important that you push yourself creatively and what I said going into the process was that it could come out way more pop than people are used to, that could be just the fact that I'm bringing my music here. But the whole idea of it was I wanted to see what it would sound like. I wanted to try that blend of bringing what I do to a new place, a new geographical location. So, to answer your question, I definitely had those fears but at the same time I think that's how you make really interesting music, when you push yourself a little bit further each time. This felt like a big push and I definitely felt it, which is why the album is called 'Wonderland'. Tony: You mentioned dealing with fear; you're a Christian, aren't you? Sarah: I am a Christian. Tony: Christians have the ability to pray and to get a bit of peace from the Lord. Is that something you've continued to do through this whole recording process? Sarah: Absolutely. I mentioned it in the car yesterday. Everything that I've done over the past year, the recordings, the writing and some of the blessings that have been happening, some of which I haven't even announced yet, it's like I'm supposed to be here, I'm supposed to be doing this. I've prayed about it so much and I've asked God to place his hands on the project; if it's his will, then I'll do it. I've always felt the will of me being here is right, I'm supposed to be here. There's a connection that's really beautiful and deep, it's a mutual love. To answer your questions it's the focal point of my music and what I'm doing, always. Tony: I've just been reading an article which effectively you wrote, the Diary Of An Album, published in Country Music magazine. You kept a diary of your time in Britain. I read it all and it was really informative and helpful but one thing I didn't see was any visit to a church. During all your time in the UK did you find time to go to a church? Sarah: I did go to church with my father-in-law, to his church. I do have a couple of things that I will bring with me when I'm out on the road. I have a devotional called Jesus Calling, that I love very much and that I read every day. I have a system when I'm travelling, no matter what; I have this alone time where I do some praying. Tony: I've never been one to insist that as soon as you stop going to church you're backsliding or anything as nonsensical as that. I've spoken to a lot of Christian artists since my Christian conversion and they either find ways and means, like you have, of being a Christian on the road, reading devotionals, taking a Bible everywhere with you, doing different things. I know one guy who listens to the Bible on his headphones, so in between music he's listening to Scriptures. It seems to me that that is such an important part. When you think about it, you said you've been working with songwriters and producers some of whom have never worked with country before and probably some of them have never worked with a Christian before.